A con artist sends you a counterfeit check to pay for goods or a service, maybe something you have advertised for sale, but the amount of the check exceeds the asking price. The con artist asks you to cash the check, keep your asking price, and wire transfer the amount of the overpayment by Western Union or MoneyGram to the con artist. Banks are obligated to make deposits available within 48 hours, but it can take weeks for a check to clear. Once the fake check bounces, the funds will usually be withdrawn from your account. You are ultimately responsible for the checks you deposit. 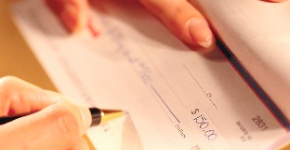 Once you accept the check and deposit it, you are responsible for paying the money back to the bank. Most American adults have received one of these counterfeit checks, and some of them have actually deposited the checks and sent money to the scammers. This makes the scam almost as successful as legitimate direct marketing of real goods. Learn how to recognize these schemes at www.fakechecks.org and read our warning about wire transfer scams and advanced fee fraud.